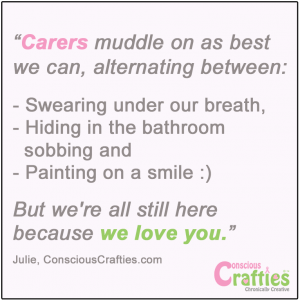 Conscious Crafties is about supporting TALENTED people who happen to have Chronic Health struggles (physical or emotional), Chronic Pain, Disabilities or are Caring for family members who are affected (as your lives have been altered too). What is Chronic Illness or Pain? Chronic Illness and Pain are life altering. Something that can sometimes be helped but not cured by medication and persists for more than 3 months. It can come and go with relapses and remissions resulting in diminished physical and/or mental capacity. It means you have to make decisions over what you can and can’t do and dramatically affects your life. It would be impossible to list all conditions here but examples are – Arthritis, Asthma, Cancer, Coeliac Disease, ME / Chronic Fatigue Syndrome, Chronic Migraines, Chronic Pain, Coronary Artery Disease, Costochondritis, Crohn’s Disease, CRPS (Complex Regional Pain Syndrome), Cystic Fibrosis, Degenerative Disc Disease, Diabetes, Dysautonomia, Ehlers-Danlos Syndrome (EDS), Epilepsy, Fibromyalgia, Functional Neurological Disorder (FND), Gastroparesis, IBS, Insomnia, Intracranial Hypertension, Lupus, Lyme Disease, Marfan Syndrome, Multiple Sclerosis (MS), Neuralgia, Osteoarthritis, Polycystic Ovary Syndrome, Postural Orthostatic Tachycardia Syndrome (POTS), Raynaud’s, Rheumatoid Arthritis, Scaroiliitis, Sciatica, Scoliosis, Seizures, Sjogrens Syndrome, Sleep Apnea, Spina Bifida, Spondylosis, Tourettes, Ulcerative Colitis – the list goes on! What are Emotional Health Issues? Mental health struggles can affect anyone of us. They can alter personalities, thought processes or social interactions. Psychological factors and environmental factors such as upbringing and social exposure can form the foundations for harmful thought patterns associated with mental disorders. Emotional health issues can be (if not more) as debilitating as Chronic Illness or Disability. Types of mental health issues can be (but not limited to) – Attention Deficit Hyperactivity Disorder (ADHD), Anxiety, Bipolar Disorder, Body Dysmorphic Disorder (BDD), Borderline Personality Disorder, Depression, Manic Depression, Obsessive Compulsive Disorder (OCD), Panic Attacks, Postnatal Depression (PND), Schizophrenia etc. What are Aspergers and Autism?